Whenever I’m at home I try to have a green smoothie as the first meal of the day. I’ve become slightly addicted to them as they provide me with so much energy. And of course they taste delicious. However, I like my green smoothies to be more on the sweet side, hence I always mix frozen banana or frozen mango into the blender. Not to forget the almond butter or peanut butter. The best thing is – you can be creative and improvise. Combine your favourite veggies and/or fruits, some kind of superfood and spices, nuts & seeds, dairy free milk of your own choice and you have yourself a delicious meal. I also prefer cold smoothies so I usually add frozen banana. Amazingly yummy. More energy – Smoothies can be very energy dense, providing your body with loads of healthy stuff. Perfect if you’re searching for a calorie dense meal – add some kind of nut butter (almond butter is great!) or why not add oat flakes for a thicker smoothie. However, if you want to keep you’re calories down make sure you stay away from the ready made ones you find in the supermarket or coffee shops, since they often contains loads of sugar. 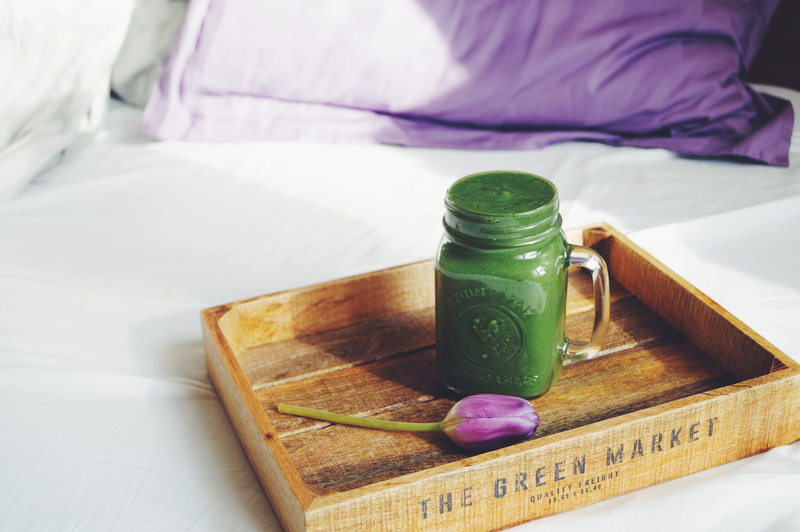 Vitamins & Minerals – Add green leafy vegetables such as spinach, kale, romaine lettuce or boost your immune system with superfoods such as wheatgrass, spirulina, chlorella and maca for essential vitamins and minerals. Easy to make & they taste delicious – Just throw all the ingredients into your blender and mix for a couple of minutes until smooth and creamy. Easy peasy. And yes, they are delicious especially if you add spices such as vanilla, cinnamon and nut butter. Yum!